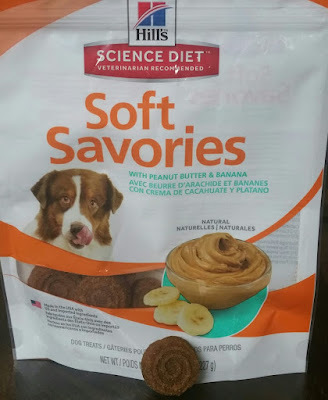 Being Frugal and Making It Work: Hill’s Science Diet Soft Savories Make Your Pooch's Mouth Water! Hill’s Science Diet Soft Savories Make Your Pooch's Mouth Water! Are your dogs spoiled like mine? Do they enjoy daily treats? My two dogs are almost as spoiled as my two kids! When it comes to treat, my two pups get them on a daily basis! This month, Zena and Thor got the mouth-watering pleasure of trying Hill's Science Diet Soft Savories with Peanut Butter & Banana dog treats! They both loved these soft, tasty treats. I think they may have thought they were getting an expensive "gourmet" treat, because they would stare and beg for more! Hill’s Science Diet Soft Savories prove that tasty treats can be healthy too. Based on the idea that daily nutrition is the most important thing that you can do for your dog, these natural treats are made only from the best ingredients, with zero artificial flavors or preservatives. The soft, tender texture will delight your deserving dog—because we all need a little snack now and then, so why not make it nutritious and delicious too? Soft Savories dog treats come in 3 flavors that are sure to satisfy your pooch's taste buds; Peanut Butter & Banana, Chicken & Yogurt and Beef & Cheddar. My two dogs both loved the peanut butter & banana flavor. I'm going to have to order the other two flavors as well and let them enjoy them as well!